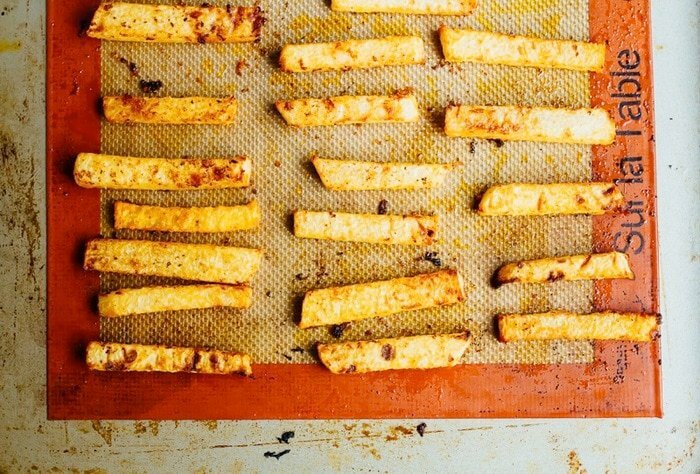 Gut-friendly baked jicama fries with turmeric and black pepper. Serve with fresh guacamole for a delicious summer side! Vegan, paleo, low-carb and keto. As temperatures rise in Richmond and we get into the heart of summer, I’ve found myself not only craving more H2O (read my last post on infused waters to spice up your life! ), but also naturally snacking on more water dense foods: cucumbers, strawberries, spinach, radish and bell peppers to name a few. I associate these refreshing fruits and vegetables with the height of summer’s bounty displayed vibrantly at local farmers markets, and childhood memories of ripe watermelon juice dripping down my face on sticky humid days. However, this year I have found a new favorite, and I’m mildly obsessed with it’s unique flavor profile. 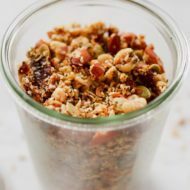 It’s nutty and sweet, crunchy and juicy, and pairs well with both savory and sweet ingredients. Not only is it a party in your mouth, but it’s also a gift to your gut due to its high nutrient content, water density, and prebiotic nature. Differing from probiotics (beneficial bacteria and yeast that live in your digestive tract), prebiotics contain non-digestible fiber that serve as food for probiotics. This superfood is straight golden gut glory. Have you guessed it yet? It’s Jicama! Jicama is a root vegetable, which shares the same color and shape as a turnip, but is about 2-3 times the size. It has a weathered brown skin (to be peeled before eating) that covers a white flesh, with a texture similar to that of a water chestnut or crisp pear. Some people describe the taste of jicama similar to that of an apple, but more neutral and certainly less sugary. I love it raw (favorite snack recipe coming soon!) and have been reaching for it instead of carrot sticks as an afternoon snack with hummus or almond butter. Helpful trick: peel + cut your jicama into sticks ahead of time, and store with prepped carrots, bell peppers, celery, and cucumber for easy snacking throughout the week. Another option is to buy the pre-chopped jicama sticks at Trader Joe’s. A little more expensive, but so convenient. Jicama is low fat, low calorie (50 calories/cup), and high in soluble fiber (6 grams/cup), which will help you feel full for longer periods of time. The specific fiber it contains, oligofructose inulin, is prebiotic and low on the glycemic index making it ideal for diabetics and those looking to lose weight. Inulins prebiotic nature promotes “good” bacteria (probiotics) growth in the intestines, as well as promotes bone health by enhancing absorption of calcium from other foods. It has an insanely high water content, about 90 percent, and provides you with a dose of calcium, magnesium, potassium, vitamins A, C, and beta carotene, which makes it an incredible post workout recovery fuel as well! 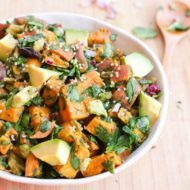 *Note – since jicama is a high fiber food you may experience some digestive discomfort like bloating and gas when you first incorporate it into your diet, so I suggest you start small. If you tend to eat a lot of fiber already like me, you will be fine, but don’t dive in too heavy or consider yourself warned! Now that I’ve completed nerding out on the health benefits of jicama, I should have your mouth drooling from the pictures I teased you with along the way. These are my golden gut baked jicama fries, which offer a lighter alternative from heavier root vegetables like sweet potato and parsnips in the summer. 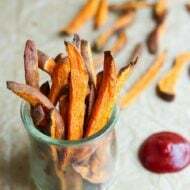 Sprinkled with an array of spices, including my favorite anti-inflammatory herb turmeric, these fries are tasty on their own, on a salad or dipped in my healthy guacamole. Low-carb, gut-friendly baked jicama fries with turmeric and black pepper. Serve with guacamole for a delicious summer side. Paleo, vegan and keto-friendly. Place jicama slices into a large bowl, add oil, turmeric, garlic powder, onion powder, salt and pepper and toss to coat evenly. Spread the fries onto a baking stone or a baking sheet lined with a silpat mat or parchment paper making sure the fries aren’t crowded. They need space or else they will start to steam and get soft rather than crispy. Bake for 30 minutes, take them out of the oven and flip, then bake for another 20-30 minutes or until fries are a little brown and have reached the desired texture. Remove from oven and serve with guacamole for dipping. These jicama fries might be a tad on the crunchy side given jicama’s natural texture. 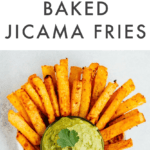 If you want them with less crunch you can boil the jicama slices for 8-10 minutes, drain the water and pat the fries dry before coating them with the spices and baking. I like the texture and don’t feel this step is necessary. Recipe adapted from Healthier Steps. Just a friendly reminder, turmeric’s golden color has a tendency to stain all that it touches so be careful while making the fries. If staining does occur, this article has some great tips for removing turmeric stains from your dishes, counters and fingers. I’ve never cooked with jicama before! It always intimidates me in the store. However the best way to introduce a new veggie is to turn it into a fry! Yum! Totally agree. You can never go wrong with fries. amirite? Will these keep if I make them ahead of time? They’re best eaten right away! I don’t think I’ve ever tried jicama before, consider it on the list! Woo-hoo! Let me know how they turn out for you. Thank you so much for sharing this recipe! 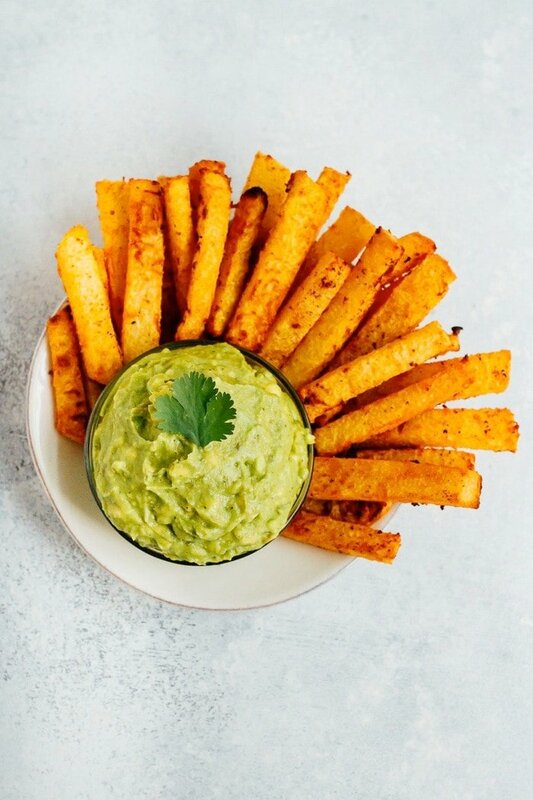 I’ve never heard of Jicama but I’d love to have a go at making these. Yum! I love jicama, but have never thought to make it into fries like this before. I will have to give this a try ASAP. i looooove jicama! i usually just have it with some lime, but this recipe sounds way more delicious!! 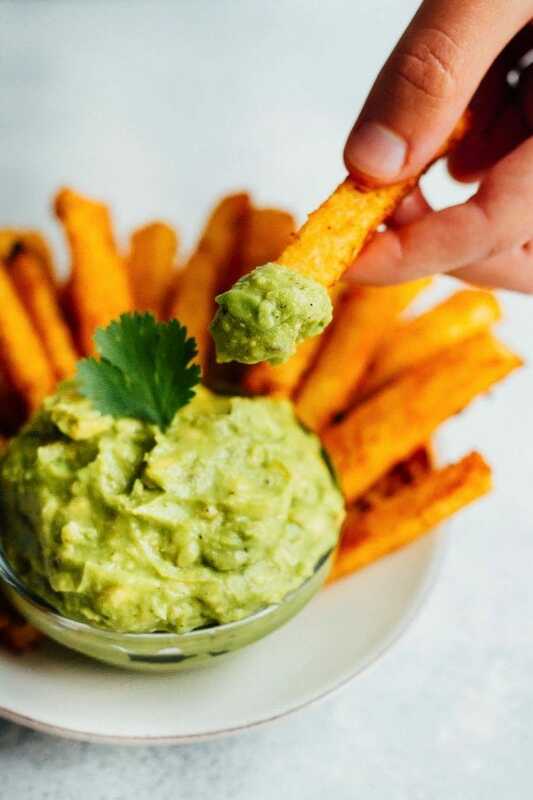 love that you added turmeric and that guacamole for dipping is genius! Yes! I love it plain with chile lime salt or with mango for a salad, but the fries are so good too. I hope you get a chance to try them, Jordan. Has anyone grilled these fries? I do a grilled potato wedge with rosemary and garlic that I was thinking of subbing the jicama in for. You could totally use this recipe and grill the fries instead of baking them. Just grill until they’re the a little brown and the texture is to your liking. Let me know how it goes. I haven’t had jicama i ages but now I’m so inspired! Thanks for sharing this, Brittany!!!! I LOVE jicama and have been meaning to buy one soon, but I’ve never thought to bake it. 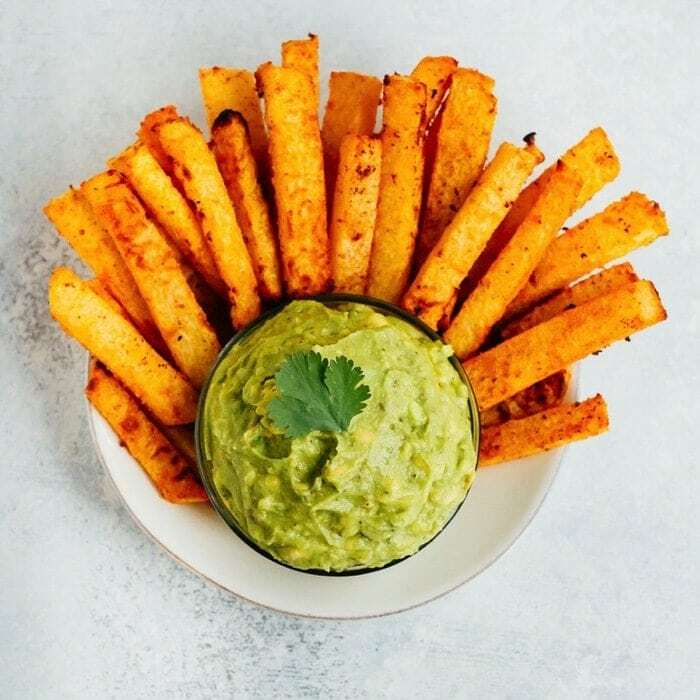 These look fabulous, especially with guacamole! I don’t cook with oil. Do you have any suggestions on how else to get the spices to cover and stick ? I love this idea and love jicama. I have NEVER been successful at getting jicama to soften up. I’ve tried baking, frying, boiling, even pressure cooking. My last one I boiled for over an hour, still crunchy, put in the pressure cooker for another 1.5 hrs, still crispy, tried cooking some of those in the frying pan & some in the oven. Total failure. But I would really like to know if anyone has ever been able to get the proper (potato-like) texture from it. I think it has the best taste out of jicama, radishes, turnips, and rutabaga (all my experiments). Any tips would be appreciated. I have a jimaca that my neighbor brought over. I’ve never tried it before, but this baked recipe with guacamole looks great! Will try it tomorrow. Thanks for the recipe!